Hungary is a country rich in football history, some of its clubs have earned international fame, there was a time its national team was considered to be the best in the world, players have acquired “world legend” status, and Ferencváros can be proud of being by far the most successful club of this football-crazy country. 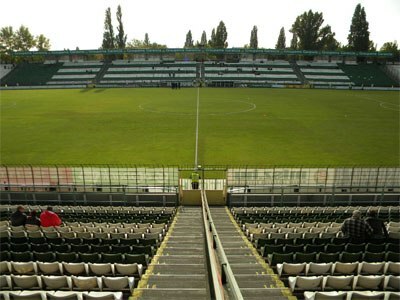 Ferencvárosi Torna (Gymnastics; so it is in fact incorrect to refer to this club as Ferencvarosi FC in English) Club, or, more simply, Ferencváros, named after the homonymous district of Budapest, were founded in 1899, and, as the name suggests, the club had from the very beginning many more sections than just football. Actually, the football section was not officially founded until next year, just in time to compete in the inaugural season of the Hungarian National Championship, in 1901. When World War II broke out, Ferencváros had already won more than a dozen league titles, being one of the two dominant forces in Hungarian football during its first decades, along with fellow Budapest club MTK, then called Hungária. Furthermore, the club had earned international recognition, thanks to tours in other European countries, but also as far away as in South America, where they faced top teams from Brazil, Argentina and Uruguay, showing people that football was played very well in Hungary. “Fradi”, as the club are affectionately called, won their 17th championship title soon after the war was over, but what came next was the worst decade in the club's history, the 50s, during which, playing under the name “Kinizsi” (from 1951 to 1956), they stayed away from any notable successes, excluding a Hungarian Cup title. Pál Kinizsi was a Hungarian general of the 15th century, and to understand why the club changed their name, someone needs to take into consideration the political context in the first half of the 50s in the country. The team changed colour as well, green was dropped, red was adopted, a switch that didn't go down well with many of the fans, until things returned to... normal in 1956. Neither the name nor the main colour have changed ever since. As it often happens, the fifties' nadir, was followed by the sixties' zenith, a decade during which Ferencváros not only returned to being the most successful team in the country, but also 'reminded' Europe of its existence, its magnitude. In 1963 they reached the semifinals of the Inter-Cities Fairs Cup, a predecessor of today's Europa League. Two years later, Ferencváros went two steps further, all the way to the top. Not only they reached the final, but they also beat Juventus, 1-0, and, to make their success even more memorable, they did so in Turin, right at Juve's home, the Stadio Comunale, in front of 40,000 people. In 1968, the Hungarians almost touched the trophy again. The system had changed, the final was double, Ferencváros lost 1-0 at Elland Road to Leeds United, and in the return leg in Budapest they were held to a 0-0 draw, good enough for the English side to lift the cup. Interestingly, the seventies had more happy moments for “Fradi” at international level, rather than in national competitions. The team won just one championship, but they did reach the semifinals of the UEFA Cup in 1972, and the final of the Cup Winners' Cup in 1975. Dynamo Kyiv turned that final match into a show of their strength, beating the Hungarians easily, 3-0 (2-0 up by halftime) in Basel, Switzerland. Ferencváros won their 23rd championship title in 1981. Excluding the first half of the nineties, when they won three titles in five years, they haven't managed to dominate again the Hungarian football scene the way they used to, but in their defence, the competition is fierce. No matter what, they remain the most decorated club in Hungary, having won several more championship and even more cup titles than any other football great in the country. Péter Lipcsei, a former midfielder who spent most of his career at Ferencváros, has played in a total of 555 matches wearing the green and white jersey between 1990 and 2010, a number though that includes friendly games. Even though official and 100% reliable numbers are hard to find, György Sárosi is considered the all-time leading goalscorer of the club, netting 351 goals from 1930 to 1948, in times of course that football was very different to what it is in our days. Flórián Albert scored 255 goals for Ferencváros in the championship alone, from 1959 until 1974, spending his entire career wearing the green and white jersey. The fact that in 2007 the club renamed their – previous – home after him, is a clear indication of who is considered to be the biggest player in the club's history. That title could have been László Kubala's, if he had spent more time at the Budapest club. Born in the Hungarian capital in 1927, Kubala was destined for even bigger things. After playing for half a dozen teams, he joined Barcelona aged 24. When he left the “Blaugrana” ten years later, he had earned himself a place in their pantheon, along with a spot in world football's elite. Barcelona is also where he died, in 2002. As previously mentioned, Ferencváros have remained in Hungarian football's elite, despite the fact that in the 21st century they haven't been as dominant as in previous times. They can be proud of having an impressive home though, opened in 2014, financial stability (more or less), the biggest fanbase in the country, and last but not least, after entering their new arena they have worked on curbing hooliganism as well, which used to be a major issue, not 100% extinct, but definitely earning less negative headlines these days than what it used to. The crest of Ferencváros includes – obviously – the full name of the club, the founding year, but also the very part of Budapest (“BPEST”) that gave birth to the team, the city's 9th (“IX”) district (“K”. Kerület is Hungarian for district). Another version of the logo includes two stars on top of the crest (symbolizing the more than 20 championship titles the team have won), and yet another version includes an eagle. A gigantic eagle is actually seen outside Fradi's modern arena, with its wings stretched, grabbing a football with its nails.